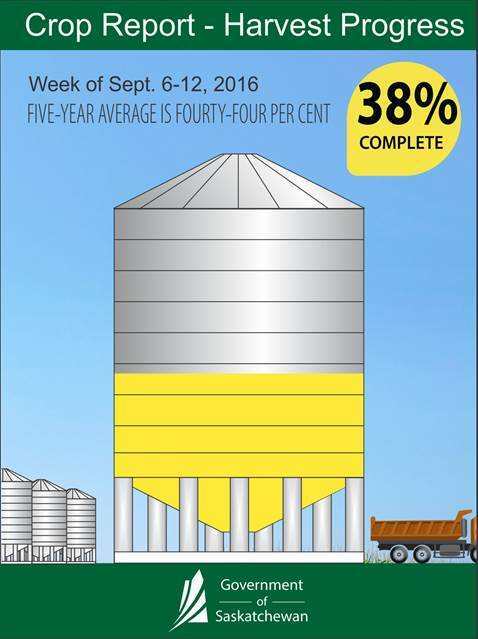 Rain slowed harvest in most areas of the province last week. The most progress was made in parts of the west-central and northeastern regions, where spotty rain showers allowed producers to continue working in the field for a day or two. Thirty-eight per cent of the crop has been combined and 38 per cent is swathed or ready to straight-cut, according to Saskatchewan Agriculture’s Weekly Crop Report. The five year (2011-2015) average for this time of year is 44 per cent combined. Regionally, harvest is furthest advanced in the southeast, where producers have 52 per cent of the crop in the bin. Forty-seven per cent of the crop is combined in the southwest, 29 per cent in the east-central region, 35 per cent in the west-central region, 33 per cent in the northeast and 17 per cent in the northwest. Ninety-seven per cent of winter wheat, 89 per cent of field peas, 72 per cent of lentils, 30 per cent of durum, 29 per cent of spring wheat and 25 per cent of canola have been combined. Durum grades are being reported as two per cent 1 CWAD, 17 per cent 2 CWAD, 30 per cent 3 CWAD and 51 per cent 4 and 5 CWAD. Pea grades are 25 per cent 1 CAN, 59 per cent 2 CAN, 15 per cent 3 CAN and one per cent Sample grade. Lentil grades are four per cent 1 CAN, 42 per cent 2 CAN, 43 per cent 3 CAN and 11 per cent Sample grade. Precipitation ranged from nil to 43 mm in the Frobisher area. The Maryfield area reported receiving 36 mm of rain, Eyebrow 32 mm, Foam Lake 42 mm, Nether Hill 26 mm and Porcupine Plain 36 mm. Provincially, cropland topsoil moisture is rated as 14 per cent surplus, 84 per cent adequate and two per cent short. In areas around Porcupine Plain, Tisdale and Arborfield, 62 per cent of cropland acres are reported to have surplus moisture. In areas around Rosetown, Kindersley and Biggar, 22 per cent of cropland acres have surplus moisture. Hay land and pasture topsoil moisture is rated as eight per cent surplus, 86 per cent adequate and six per cent short. Frost was reported in some areas in the northwest, with temperatures dipping to -2C; however very little crop damage is expected as the majority of crops are mature. Wet harvest weather continues to cause downgrading in crops. Bleaching, sprouting, fusarium and earth tag are causing grade loss. Producers are busy harvesting and seeding winter wheat. Follow the 2016 Crop Report on Twitter at @SKAgriculture.